"This breakfast provides protein, whole grains, and fresh fruit for a breakfast sure to help you start your morning right. Simply mix together and leave in fridge overnight. Overnight oats taste great cold or heat for a few minutes before serving." Combine milk, oats, lemon zest, and vanilla extract in a large bowl. Cover and refrigerate until oats have absorbed milk, 8 hours to overnight. 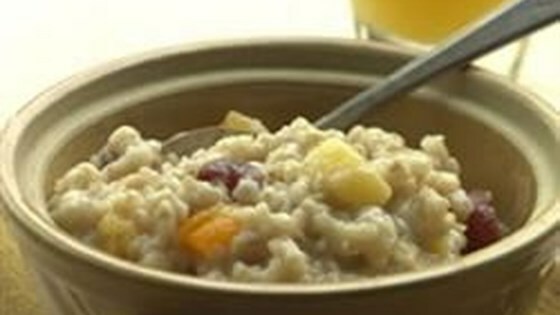 Stir apricots, pine nuts, and agave nectar into the oatmeal. Use a milk substitute instead of the milk if preferred. Other seasonal fruit can be substituted for the apricots.